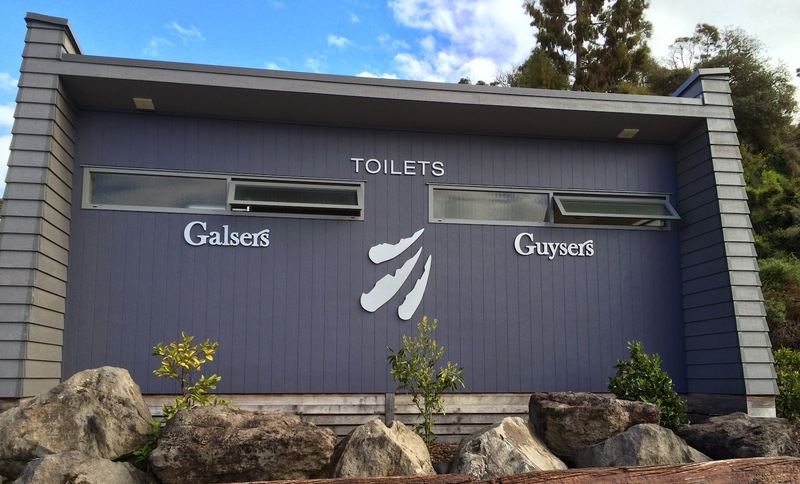 Day 32: Napier to Rotorua, NZ. Saturday morning blew in with sparkling blue skies as we watched the sun rise over Hawkes Bay from the comfort of our hotel room. For one last view of Napier before leaving town, we drove up to Bluff Hill Domain, a park overlooking the port and the city. Once the site of a defensive World War II gun battery, the bluff has been transformed into a botanical delight with blossoms in shades of yellow, red. blue, orange, purple and pink. Every plant seemed to be in bloom on this sunny spring morning. Today's forecast called for 25 to 35 mph winds again, and at the top of the bluff we could feel the full force as we gazed down at the port activity. 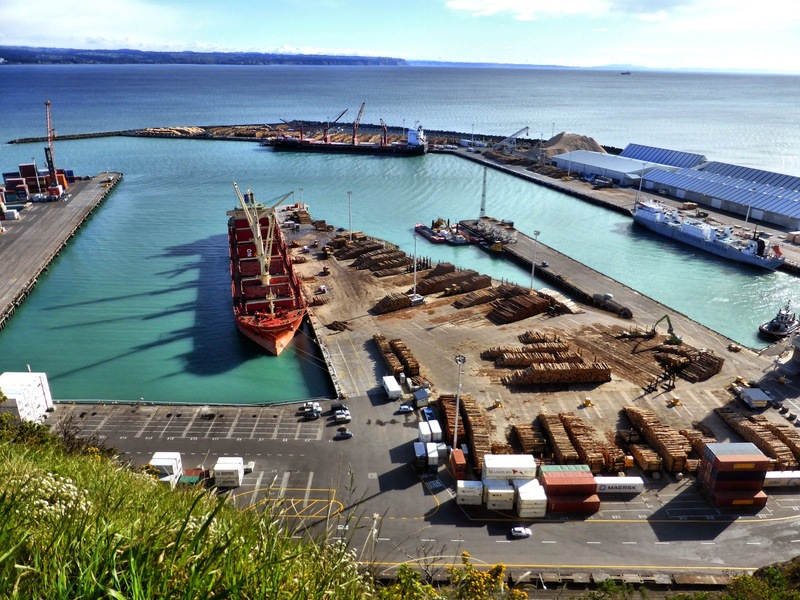 Significant amounts of sheep's wool, timber, and wood pulp pass through Napier each year bound for export markets. Much of the region's apple and grape crops are also shipped from this port, as well as the products of Hawkes Bay wineries. 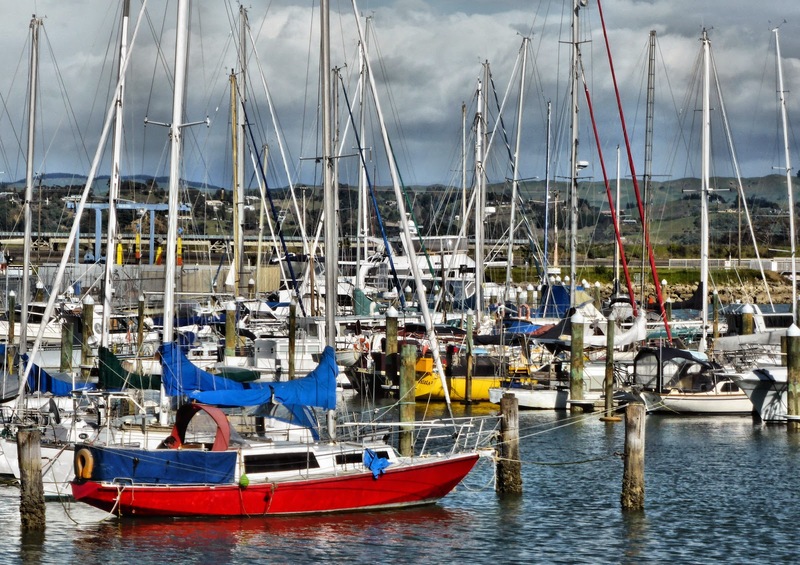 After a brief stop to admire the boats in the town marina, we finally turned our backs on the bay, headed inland on State Highway 5, the Thermal Explorer Highway. 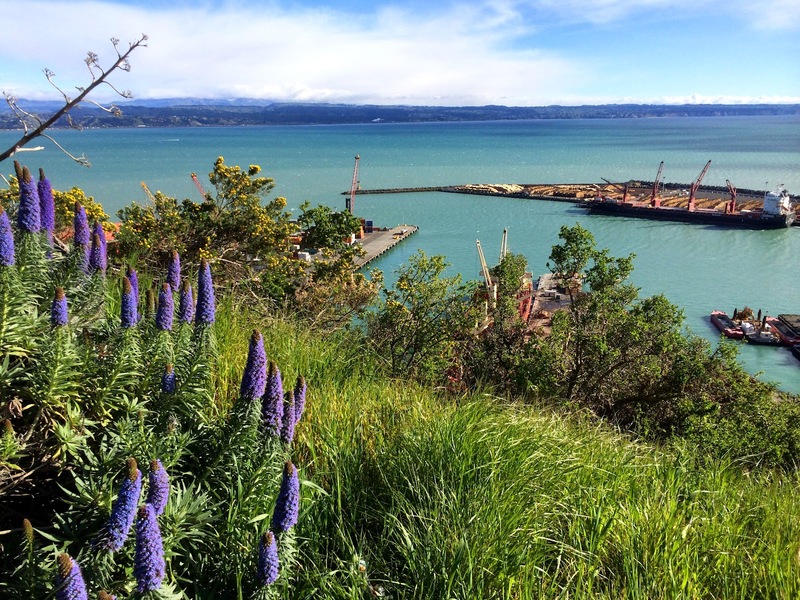 Bluff Hill offered an excellent bird's eye view of this busy port. Just ten miles north of Napier, we spotted an LED highway alert sign near Eskdale, warning of winter driving conditions along our route. The pump jockey at the Mobil station where we stopped for fuel confirmed that snow had fallen in the mountains last night. We were encouraged by his confident assurances that between the traffic and the wind, the road should be cleared by the time we reached the snowfall area. Meeting a snowplow a few miles up the road heartened us further. 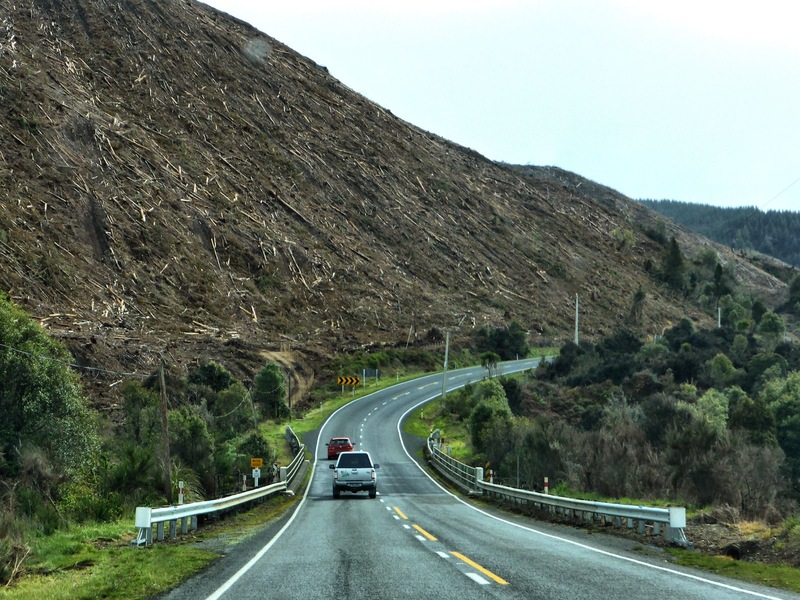 Along SH-5, we drove through mile after mile of the Kaingaroa Forest, the largest forest on the north island. After much of New Zealand's native forests were harvested by early settlers for building construction, the Monterey pine was introduced as a timber crop in the 1850s. 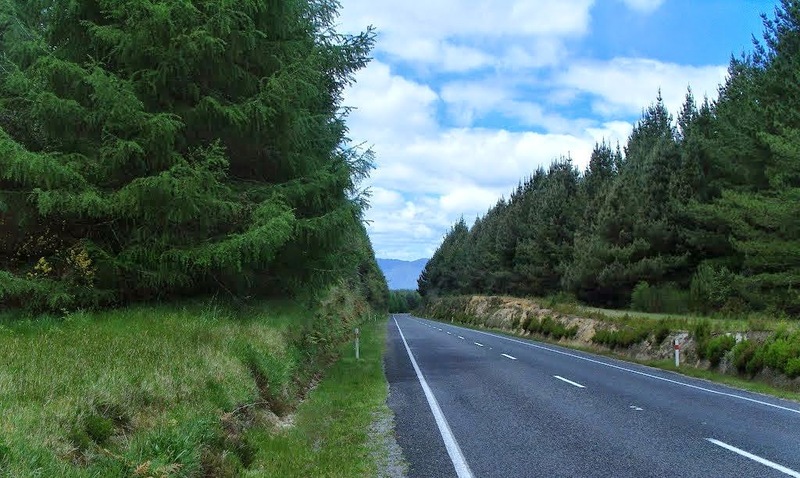 A fortuitous choice, the Monterey fared better in New Zealand than in its native California, maturing in this temperate environment in less than 30 years, Nine-tenths of New Zealand's massive plantation forests today are planted in Montereys, feeding the country's exports of logs, timber and paper products. 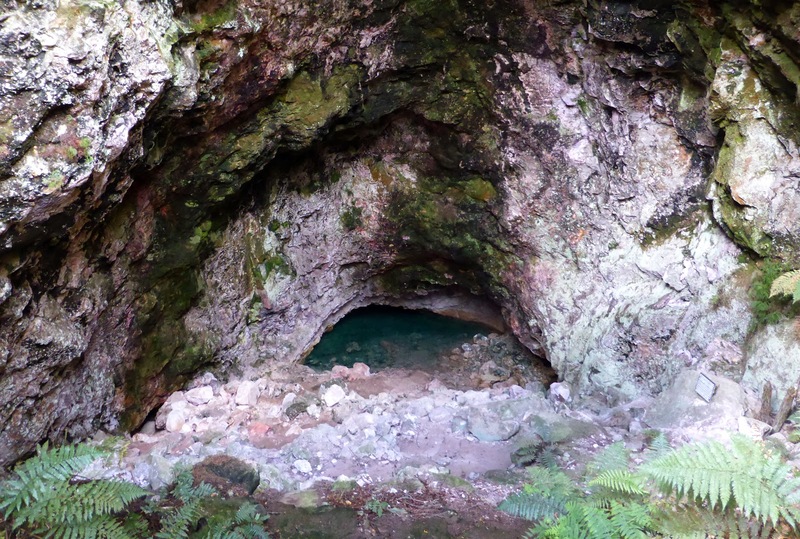 Encompassing an area the size of Rhode Island, the Kaingaroa Forest was established as a plantation forest in the 1920s, a state asset owned by the NZ government. 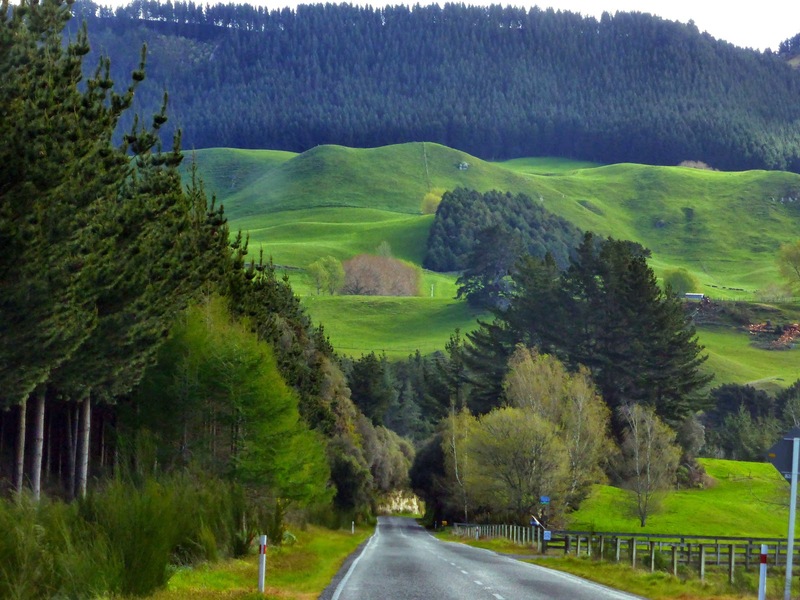 In 2009, the land was restored to its traditional Maori owners. The forest is planted and harvested by private companies which rent the land. As in other parts of the country, forests in all stages of growth and harvest were visible along the roadway. Due to their endangered status, logging of native forests is now prohibited unless the land owner can prove it sustainable. North of the tiny crossroads called Tawarewa (emergency petrol the only service available), we pulled into a scenic lookout for a break. 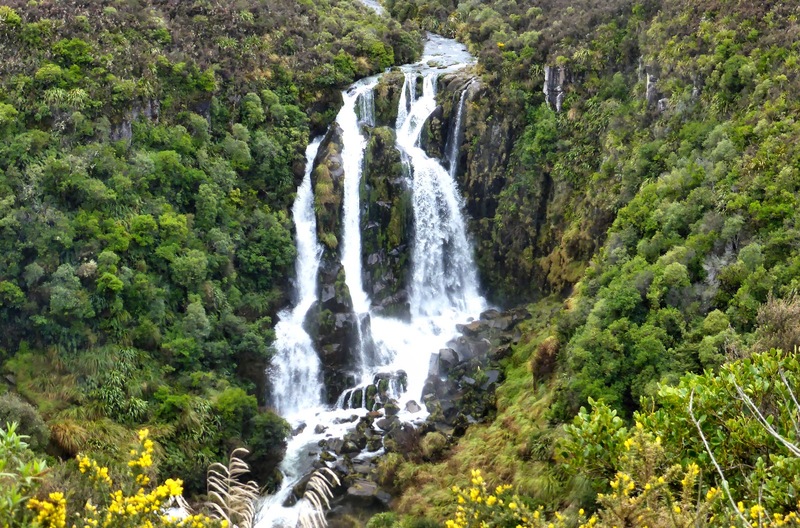 When we got out of the car to stretch our legs, we were treated to a breathtaking view of Waipunga Falls, a tiered waterfall created as the river of the same name plunges 130 feet down into the valley below. What a fanastic place to site a rest area! As we passed by a handful of buildings identified on the map as the hamlet of Rangitaiki, the intermittent rain briefly changed over to sleet. A bit later we watched a heavy spate of sleet bouncing off the pavement as we were eating lunch at The Vine in the town of Taupo. Although the service was abysmally inefficient and confused, we didn't mind too much as we weren't eager to head back out in the icy shower. Moreover, the food was quite good and we were engaged in a lively conversation with an Australian couple, Jenny and William, at the next table. They had driven into town from a fishing lodge at the southern end of Lake Taupo, a spot they have visited annually for 20 years, stalking steelhead trout in the lake and area rivers. 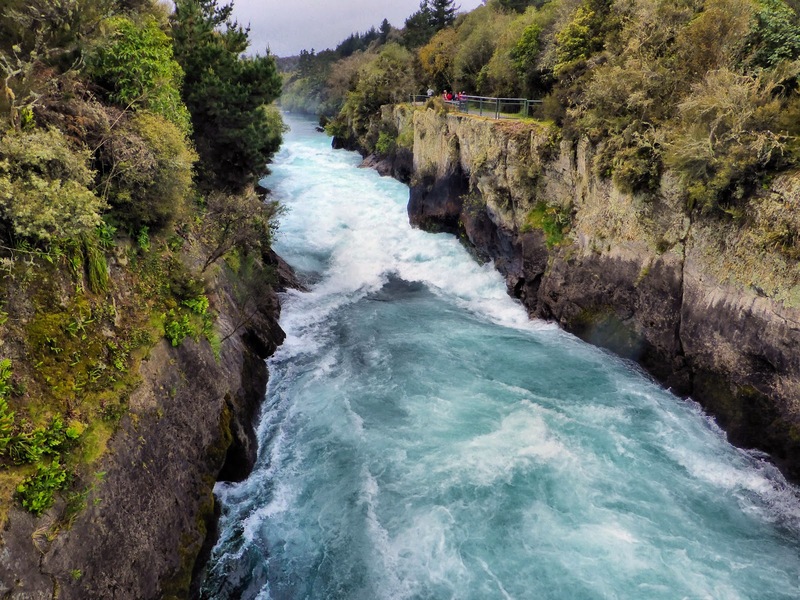 When we finally left The Vine, we hooked up with SH-1 and drove north to Huka Falls, a powerful 53,000 gallon/second cascade created when the 350-ft. wide Waikato River bulldozes its way into a canyon 50 feet across to reach Lake Taupo. From this impressive falls, we visited the nearby Mighty River Geothermal Station. 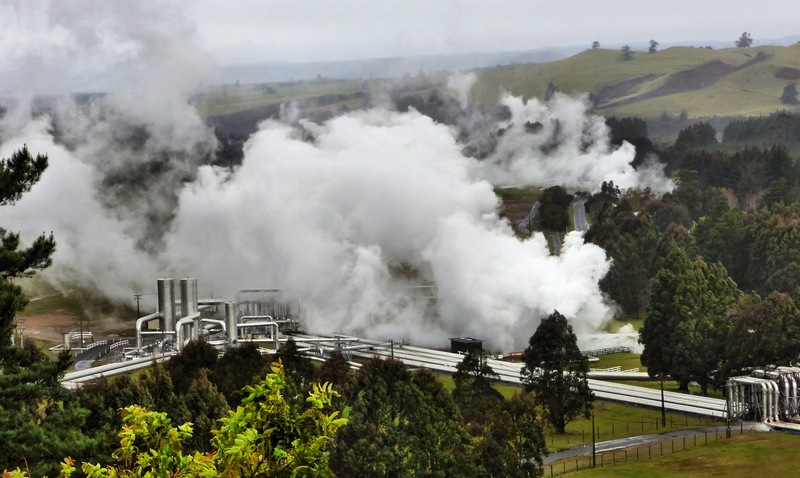 Built at a cost of $415 million and opened in 2013, this plant can provide electricity for 80,000 households, making it New Zealand's largest geothermal power station. 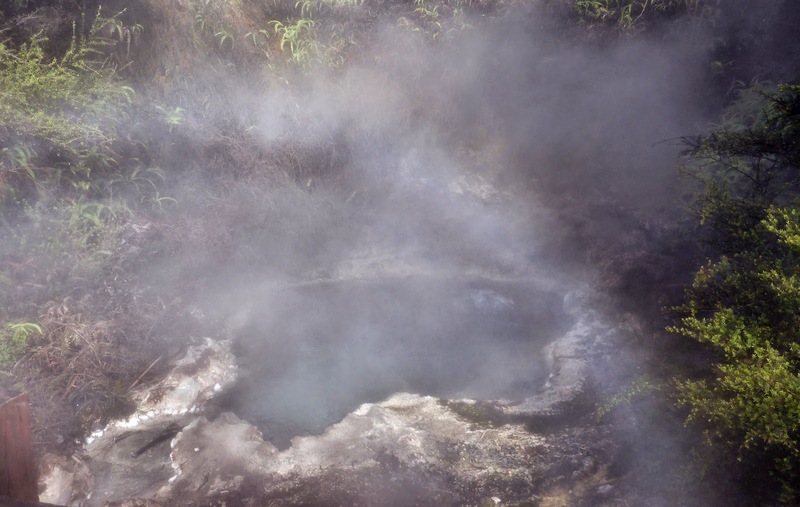 Steam is provided by wells up to 10,000 feet deep with temperaures approaching 600 degrees. North of the power plant, we shifted over to SH-5, enchanted by the lumpy, grassy hills and valleys. Surely Tolkein had this area in mind when he envisioned Middle Earth. Many shelterbelts have been planted in this windy landscape. Near 3 p.m. we took a detour west onto Tutukau Road to check out the Orakei Korako geyser field. At $28 each, the admission was a bit steep but the reviews we checked on the fly as we drove north indicated this was an opportunity to see "Rotorua without the tourists." Small wonder there were no tourists; there were no active geysers, just some steam puffing out and a tiny bit of half-hearted bubbling. 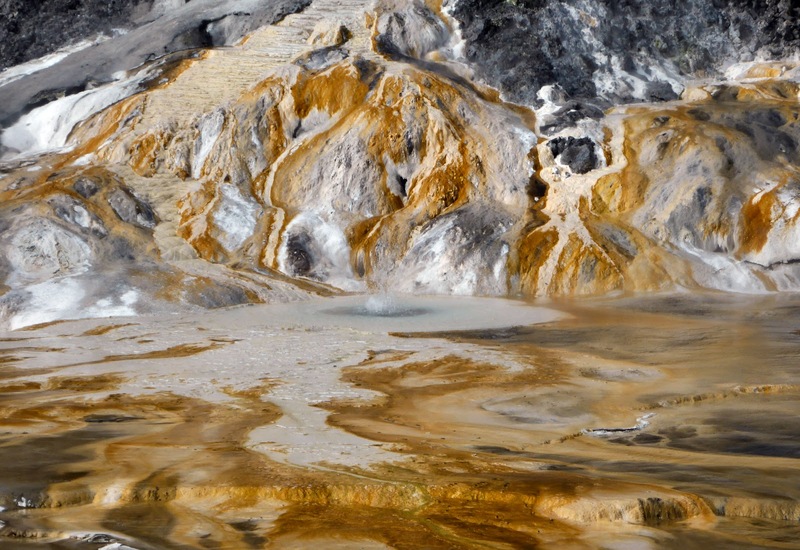 Signage warns visitors that most of the thermal springs on site could erupt at any moment. Yet the boardwalk "erected for your safety" passes within a few feet of these dangerous and capricious gushers. More subtle messages told another story. The rocky surface around most of the geysers in this field was bone dry. It was difficult to choose which rationalization we should accept for the inactivity—the erratic eruption evasion offered by the visitor center staff or the alibi given us by boat operator who ferried us across the river to the geyser field: "Well, the weather is just too cold for the geysers to be active" (the kind of statement that makes you start rubbing your forehead to wipe off "STUPID," which you assume must be written there). Arriving in Rotorua around 5 p.m., we checked into our Quest apartment hotel, prepared dinner, and made some hot plans for seeing the local geothermal activity tomorrow. 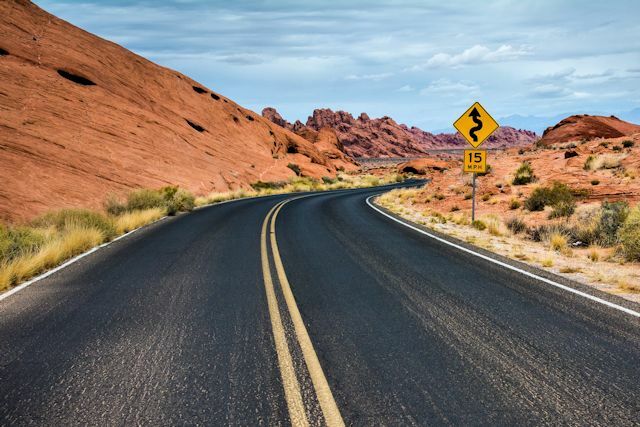 As we've often stated, the left-lane driving in New Zealand and Australia requires constant vigilance from us right-laners, particularly since all the roads we're driving on are unfamiliar to us. 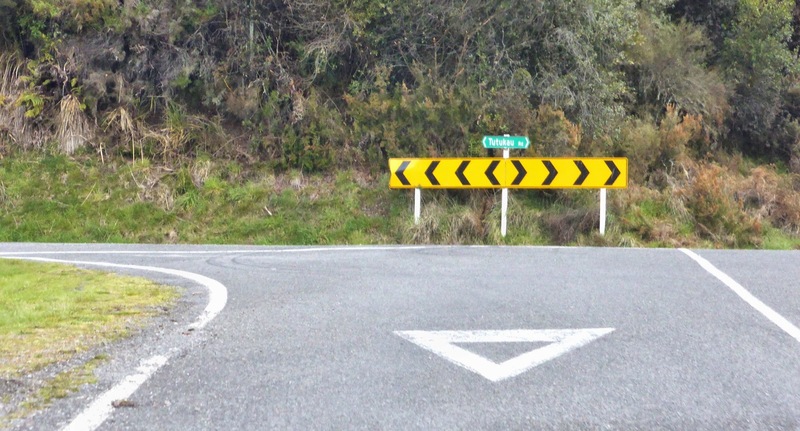 One form of signage that adds to the confusion is the yield sign painted on the road at many intersections. Meant to signify that the driver approaching the intersection should yield to the oncoming traffic on the cross street, to someone accustomed to right-lane driving about to turn onto the road, it can appear to be an arrow pointing in the direction of the traffic flow, the way this type of signage is typically used in the U.S. Following that instinct, of course, would put you on the wrong side of the road.